This week we had a week off so decided to go for a road trip along the north coast of NSW. We drove about 8 hours north from Sydney during which we stopped off at different destinations. This is what we got up to! First stop was in Seal Rocks where we visited our friends dairy farm – Burraduc Farm and stayed with our friends at Bluey’s Beach. We love staying in this area because it has everything! Gorgeous walks and nature, beautiful beaches and of course the farm life 🙂 When we arrived we went straight to the farm to play with the new born buffalo babies and watched Elena (the producer) make some fresh buffalo mozzarella. It was great timing! There was a whole group of us so then we we drove over to the beach for a quick swim before the end of the day and then headed back to the farm for dinner on the deck. We had a feast! After that we went to Bluey’s Beach with our friends where we stayed the night. The morning after we visited Moby’s restaurant for a quick coffee and then a swim at the beach. We had a late lunch at Hamiltons Oyster Bar in Forster and then headed north! Our next stop was Smoky Cape beach campground. This place was stunning! We drove in the dark and the trees were extremely tall and lush. We were lucky enough to find a camping spot in this busy camp ground and cooked a quick dinner before sleeping. The next day we woke up to the sound of the ocean, made ourselves some coffee and walked around the corner onto the beautiful wild beach! It was a bit too crazy to swim, too many rips around but it was still lovely just lying on the sand and basking in some morning sunshine. There is something magical about the ocean in the morning. We decided to walk along the stunning beach and found ourselves standing in front of a brown snake…who knew these snakes liked to lie on sand? If that wasn’t crazy enough we then saw it enter the waters edge and enjoy the soft waves coming onto the sand. We decided to walk back and found ourselves lucky enough to see dolphins jumping out of the water in the distance! It’s always so thrilling to see dolphins…the pure joy they seem to have swimming and jumping in the water is really energising. Shortly after we decided to pack up and move on North. We heard that the town of Bellingen is pretty nice so after a quick stop at Nambucca Heads where we snacked on some local prawns we headed to Bellingen. It was a shame it felt like 40 degrees. Such a difference in temperature 30 minutes inland! We drove through the town which looked so lovely but we headed straight to the Waterfall at Dorrigo National Park! I can’t remember the last time I swam in a waterfall. This place was so beautiful and surprisingly not ridiculously packed with people either. We had a lovely swim and swam all the way to where the water was splashing down. After exploring this area we decided we wanted to go camp back at a beach..it was just way too hot this time of the year inland. We weren’t sure where we were going but decided to head north, our first stop was busy, too busy there was no space so we had to drive even further north. 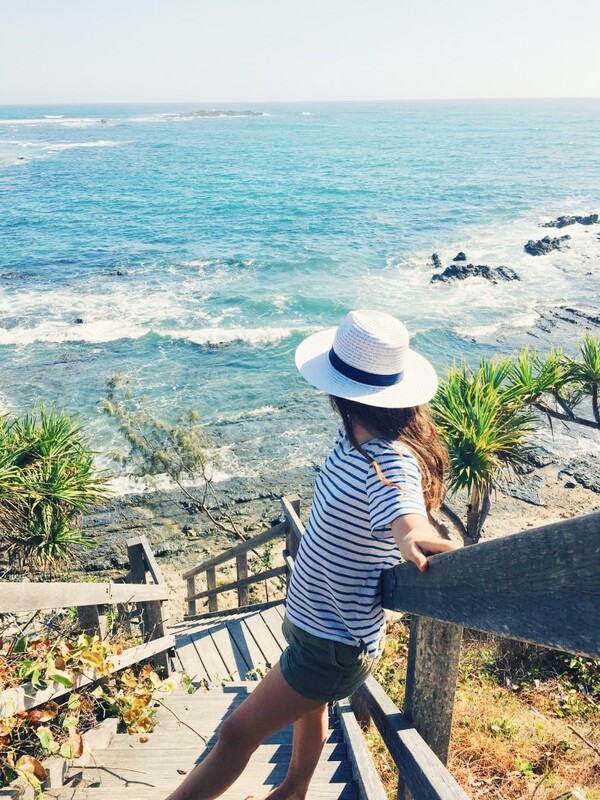 We headed to Wooli Yuragir National park and that was perfect! We stayed just right from Diggers camp and it was amazing. I LOVE it when you find a new place and it has that summer holiday vibe. We arrived just before dark and once we set everything up the light had disappeared, so once again I had to make dinner in the dark..I really enjoyed it though. I boiled some roughly sliced potatoes, and on an iron cast pan I fried diced capsicum, garlic, onion and herbs, then fried some halloumi topped with lemon juice, broke that up into smaller pieces and mixed everything together in a bowl. Then for some extra cheesiness I grated some cheddar cheese, and placed the mixture plus the cheese in wrap on the pan..and fried it on both sides topped with fresh coriander. I wish I had a photo of this but it was too dark. We spent the night looking at the star filled sky and listened to the ocean…it was unreal. This is why I love camping! The next morning we made some coffee and walked over to the stairs looking over the water. I love moments like these..we just sat there on the stairs, with a hot cup of coffee and felt the morning sun over us while we stared out over the rocks and soft waves. We decided we weren’t moving from this place so went to explore the beach next to us…that was even more heavenly. There we found a long ocean beach and right next to that a natural rock pool/lagoon sort of space. Created by rocks surrounding the water, this part was calm and absolutely lovely to swim in. We spent the most part of the day here, just lying under the trees or the sun. We then visited Minnie Water Store to get some fresh food. There I even found fig tree organic meat! They also had lovely home made jams, sauces and delicious coffee too. Check them out if you are around! After that we went swimming in the river and then found a seafood shack. We bought a bag full of prawns and headed back to our camping spot where we snacked on mango, prawns and drank cider. For dinner I made burritos and this time we made dinner before it was too dark! It was perfect. The next day we headed back South to Bluey’s beach to enjoy New Years Eve with friends. Good article about your road trip.. sounds like you had fun and found some good food too! Thanks Tim. It was great, wishing we were back on the road exploring! What a nice report to read. You mix up traveling and food in the best way possible. And with lovely pictures to back your story up!